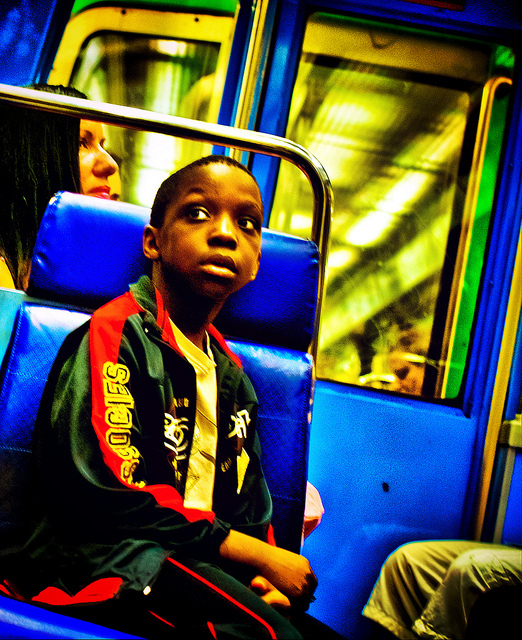 A boy aboard the Paris Metro. Photo by Takadanobaba Kurazawa, via Flickr. Click above to see the photo on Flickr. This photo has a little of everything: color, contrast and, of course, a cute boy looking away from the camera. It’s one of many striking photos by Takadanobaba Kurazawa on his Flickr photostream. As I’ve been writing on a nearly everyday basis, we’re trying to spruce up The Source with more photos and other visuals. To accomplish this, I’m scouring Flickr and asking readers to submit photos that chronicle how people get from Point A to Point B, the very thing Metro tries to accomplish 24-7. There’s certainly no reason someone couldn’t snap a similarly amazing photo aboard a bus or train in Los Angeles County and we’d love to feature it. How to submit? You can post photos to Metro’s Flickr group or email them to us at thesource@metro.net. If you would like to see some of the other photos that we’ve featured, click the ‘art of transit’ below.